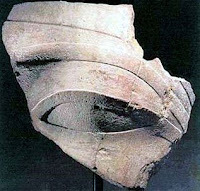 There are several reports that the "eye" (c. 50 cm in length) from a statue of Amenhotep III (1390-1352 BCE) will be returned to Egypt in the next four weeks ("Switzerland to return stolen Pharaoh's 'eye'", AFP, September 10, 2008; "Egitto recupera occhio Amenhotep da Svizzera", ANSA, September 10, 2008). According to ANSA, negotiations have been ongoing since 2006 (see "Egyptology News" from February 2006). The statue was discovered at Amenhotep's mortuary temple near Luxor in 1970 (or 1969, according to ANSA); the eye was subsequently stolen in 1972. It then passed into the hands of "an American antiquities dealer" (who?) and then passed through Sotheby's (where? when?). It then passed into the hands of a "German antiquities dealer" (who?) and was then, according to AFP, sold to a "museum in Basel, Switzerland" - identified as the Antikenmuseum by the ANSA report. A parallel report by ANSA suggests that a Swiss collector had donated the eye to the museum in 2002 ("un collezionista svizzero che l'aveva donato al museo") after acquiring it at Sotheby's. The report, from two reputable news sources, seems to lack detail at critical points. Is the "Swiss collector" the same as the "German antiquities dealer"? What is interesting is that stolen, but recorded, antiquities from Egypt are being returned on a regular basis. The Antikenmuseum will, perhaps, need to look at its acquisition policy. Should it require documented histories of antiquities? "The SCA said it also asked Basel Museum in Switzerland to return the left eye of a statue of king Amenhotep III, which it said was stolen from a temple in Luxor several years ago." There was an “Eye of Amenhotep III.” in the Norbert Schimmel Collection that was sold at Sotheby’s New York on 16 December 1992, Lot. 87. The catalogue entry does mention that this eye stems from “a Colossal Quarzite Statue of King Amenhotep III.”, and that it was on loan to the Metropolitan Museum. I cannot confirm that this is the same eye as the one which is going to be returned to Egypt, though compared with the information released by AFP, it could well be. In that case, it was not “sold to an American antiquities dealer who then auctioned it at Sotheby’s” – as AFP quotes culture minister Faruk Hosni. In addition, I have full confidence that the management of the Antikenmuseum Basel does preferably acquire objects or accept loans or gifts that have a solid history and publication record, especially since Switzerland implemented the Cultural Property Transfer Act in 2005 (which is based on the UNESCO convention of 1970). In view of the publicity given to the Schimmel sale at the time, one could argue that the eye of Amenhotep III. fulfilled such criteria – again if it is the same as the one that is going to be returned to Egypt. Yet, one might ask why the Egyptian authorities did not request the return of the eye already in 1992? In addition, I wonder, why one has to question the information given by “two reputable news sources” on the subsequent owners (the German dealer and the Swiss collector)? There are several serious collectors in Switzerland (and elsewhere) that prefer to keep a low profile – and not everybody has bad intentions when collecting ancient art. The fact hat the Antikenmuseum Basel did (and could) not return the eye immediately after the piece had been identified can probably be explained with the Swiss legal system that values a bona fide acquisition and the presumption of innocence until proven wrong (though I do not know the circumstances in this case). It would surely be best to ask the museum directly about the collector and the German dealer before jumping to conclusions. And finally: it is a wonderful thing if the eye can be united with the face to which it belongs, and I hope that this will happen in due course, and that the Egyptian authorities will inform the world press about its successful restoration too. So the question remains: why did the Egyptians not react before the Sotheby's sale? I am grateful for this information and the confirmation that the eye had once been in the Norbert Schimmel collection. (See Tamim Elyan, "Egypt to retrieve Amenhoteb III's stolen eye", Daily Egypt News September 10, 2008. I think that you would agree that the news stories are confused. It would be helpful if the Antikenmuseum Basel could issue a press statement. Marc Fehlmann asks:"So the question remains: why did the Egyptians not react before the Sotheby's sale?" I think the realistic answer is that there is so much Egyptian stuff of dubious and unstated origin scattered in a huge number of collections - both private and public - all over the world that it would require a mammoth effort to check up and chase up every single one of them in just a few years. The SCA set up the Department for Retrieving Stolen Artifacts in 2003 (so after this sale) and it has been an uphill battle persuading collectors and museum professionals to part with objects that quite clearly are stolen. I personally think the archaeological services of the so-called "source countries" like Egypt need all the help and support they can get from those concerned about the integrity of the archaeological record, rather than criticism for their alleged tardiness or neglect in the past.